Ever miss being a child, playing games at your grandma's or in your old bedroom? Then look no further! The Adventures of Elena Temple is the classic you never knew existed. And the best part is that you can play it on virtual old machines that kind of sort of maybe existed. It's not like you can remember for sure anyway, right? Collect as many coins as you want, but we both know you'll get them all, you're a completionist, don't even try to deny it! You can play the Alpha Demo now, for free. And, if you like it, please consider purchasing the full game. The Aventures of Elena Temple should run on most Windows computers that aren't on display in a museum, but if you have one that doesn't run it, you have my deepest sympathy. Just to be safe, you should have at least the below specs. But to be 100% sure, download the demo first and check if it runs ok before making any purchase. Indie Retro News: "[...] The Adventures of Elena Temple goes all out. 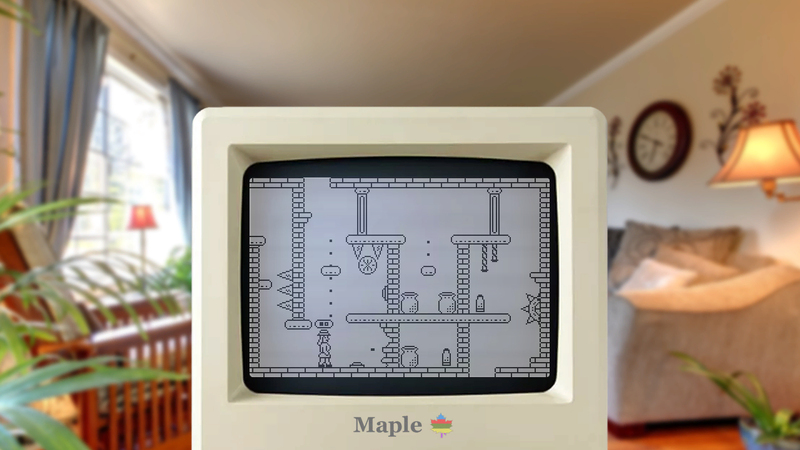 [It] is played in such a view point it takes you back to being a kid again"
gcup.ru: "[...] visually the game will appeal to fans of the old school"
idpixel.ru: "The author [...] even went a little further and depicted all those retro-consoles and computers on the screen"
Le Mag MO5: "[The] developer GrimTalin has pushed the nostalgic aspect a a little further [...] the charm of the children's room or grandma's salon works"
Please download and play the demo before making a purchase! I don't want to mislead anyone into spending money on the game. That's why I made this demo version, so you can try it and see for yourself if you like it and if it works properly on your machine. And only then buy the game, if you consider it's worth your money. I'm a solo indie developer, I loved making The Adventures of Elena Temple and I hope you enjoy it! Please leave me some feedback if you play it. As you're probably used to from the last updates, this new version has three new mechanics. The on/off spikes are timed obstacles, showing their sharp selves and then hiding back in after a while - you need to time your moves accordingly to avoid a spiky death! The spiked wheels spin back and forth, sometimes on the ground, other times through wall channels. You can only jump over them or use the environment to get past them, because if they'd have a mouth, they'd laugh at your puny bullets. Finally, the pressure platforms move when you stand on them. They can go both ways or just one way, meaning they automatically go back after you step off them. There are also call buttons for some of them, making them move in one direction or the other - a very useful contraption for solving puzzles. There are 11 new dungeon rooms using these mechanics. The GIF above shows the design process of one of these rooms - there are a couple of extra tweaks I've made after recording the footage. There are now 49 rooms in the game, including the secret ones and everything. There will be an addition 6 rooms in the final version of the game, for a total of 55 dungeon rooms. Based on the feedback I got from various players, I finally decided to add respawn points in the same dungeon room you're currently in. Up until now, you'd respawn at the last thing you collected, be it coin, bullet or gem. This led to a lot of situations where you'd die in a room and respawn a couple of rooms away, meaning you'd have to repeat the previous path over and over until you progressed past whatever nasty contraption was giving you trouble. While I kind of sadistically liked the pressure this put on the player and how it gave them another reason to avoid dying, watching people try out the game cemented my doubt that this was negatively affecting the flow and enjoyment of the game, especially since you're likely to die a lot in The Adventures of Elena Temple! So, the system is now this: when you enter a room, a respawn point will be activated somewhere in the vicinity of where you entered from. If you die, you'll respawn there. If you collect something in that room, the respawn point moves to where that collectible was located, similar to how it was before this update. While it does make the game a bit easier, it also makes it flow a lot better, which is what matters most to me. As I was telling you in the last progress post, The Adventures of Elena Temple was at Indie Garden Assembly in Valenciennes, France. It was a great experience to interact with players in person, to watch their reactions as they play the game and I gathered valuable feedback from them. As a result, besides the two major changes above, I also made a bunch of other tweaks to the game, especially on the level design side. 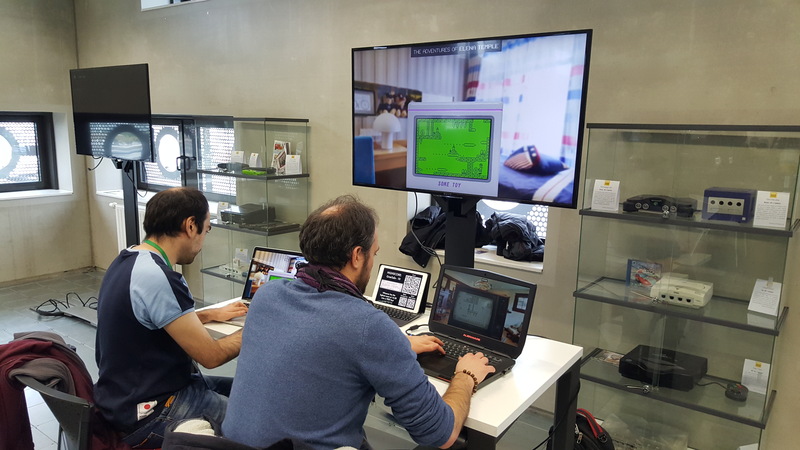 In the picture below you can see people trying out the game and the perfect location to showcase it: between two displays with retro consoles! As a bonus for going to IGA, I made the mandatory trip to Paris, which was awesome, but also a trip to Dunkirk - and I have to tell you, sitting on that huge beach was one of the most relaxing experiences I had recently! The game should be live on Steam on March 15th and, of course, also on itch.io. If you haven't already, you can wishlist the game. Seeing that the final price will be higher than the current Early Access price, you should also consider purchasing the game now on itch.io, as it will also grant you a Steam key after the game is live there. As a closing note I'd like to sincerely thank all of you who have supported me this far in creating The Adventures of Elena Temple. I'll see you all at the finish line, in less than a month! And thank you for reading my silly posts!